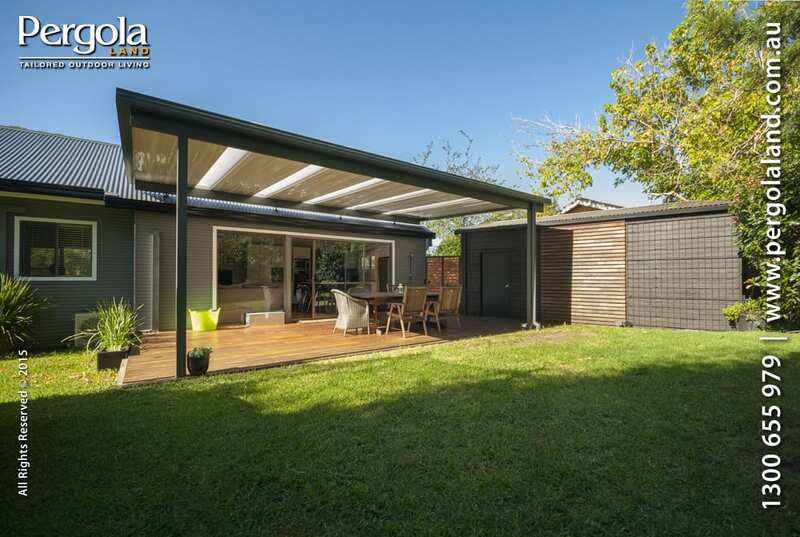 Pergola Land completed a perfect example at West Pymble; a sloping flyover pergola. Flyover refers to the use of roof brackets where instead of attaching the structure to the eaves or wall, brackets are fixed to the house rafters. The pergola roof effectively over laps (flyover) the house roof. Benefits of this style of attachments include higher roof height, greater sense of space, better airflow and access to the existing house gutters. The flat/sloping design provides an attractive uncomplicated simplicity that provides full utilisation of the outdoor living area. Colorbond steel roofing is an excellent choice to give shade and reduce the direct heat, this kind of roofing can be combined with polycarbonate ‘Light-Strips’ to aid in retaining light into the house. The Aluminium Frame offers superior style, strength and longevity in framing as it cannot succumb to rot or rust such as timber and steel. The client has really finished off their back living space with decking, gardens and tasteful colour co-ordination. Increase Privacy in Your Backyard With These TipsIt’s not just a Patio, it’s a lifestyle!